Come, get a slice of this pizza! Which camp do you belong to when it comes to fruit sprinkled with salt and spices? When my children were little, they scrunched up their noses at the very thought of it. I grew up eating fresh, ripe guavas sprinkled with salt and red chili powder …..hmmm… my mouth waters even as I write this. But when my friends offered watermelon and bananas sprinkled with salt and black pepper, I remember being a little reluctant to try it. Bananas, I am still not sure 🙂 but love chaat masala or other spice mixes on some of the fruit, including watermelon. I love how the spices bring out the sweetness of the fruit. When a Mexican American friend introduced me to Tajin, which is a fruit and snack seasoning, I was hooked! It has salt, red chili pepper and the tanginess of limes too. Curried, fluffy quinoa is quickly becoming our favorite, which is huge because we were not fans of quinoa, when we first tasted it. The extra minutes taken to rinse and roast the quinoa are well worth it when you see and taste the difference. 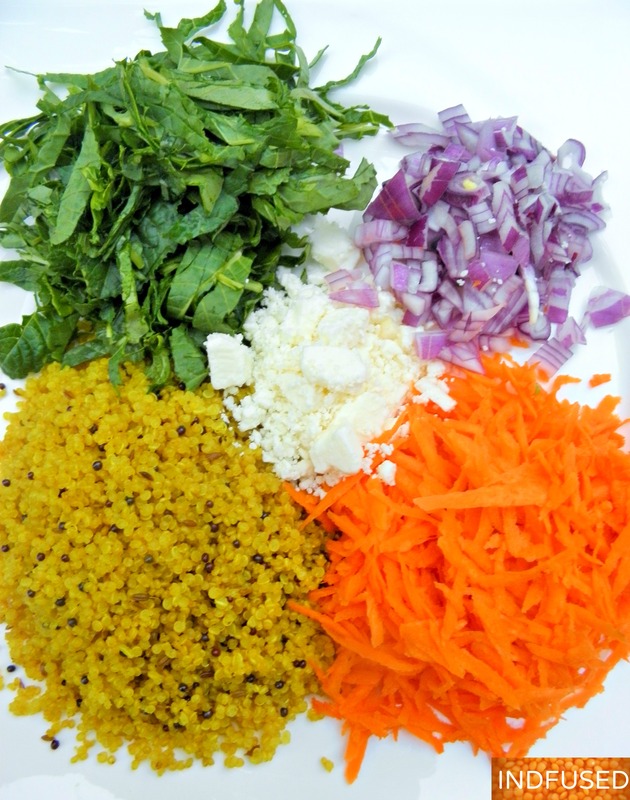 The combination of this curried quinoa goes amazingly well with the baby kale, diced red onion, grated carrots and feta cheese. 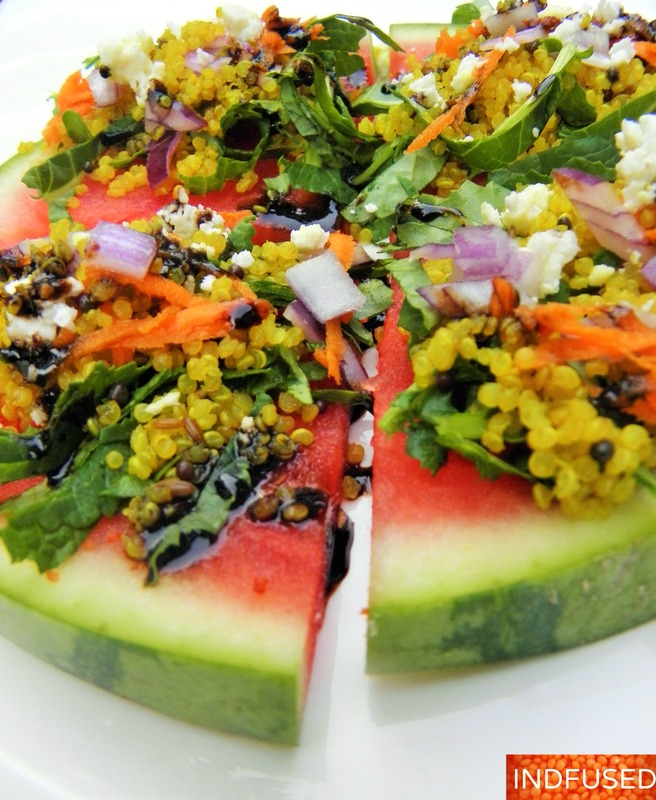 The watermelon pizza base, with the curried quinoa salad and the balsamic curry dressing drizzled on top, is an explosion of flavors in your mouth. It tickles all the taste buds with its spicy, salty, bitter, sweet and tangy flavors! Heat the oil and ghee over medium heat. Add the mustard and cumin seeds. When they start to splutter, add the asafetida and chili pepper. Lower the heat, add the turmeric powder and the washed and drained quinoa. Roast the quinoa well with the spices for about 2 minutes. It will start to make a crackling sound. Add the half cup of hot water and sea salt to taste. Stir and let the quinoa cook, covered, on low heat, until cooked, about 25 minutes. Let it cool. Remove the green chili pepper slices and discard. Fluff with a fork and add the kale, onion, carrots and feta cheese. In a saucepan, reduce the balsamic vinegar for about 2 minutes on low heat. Add the brown sugar, curry powder, ghee and the sea salt and whisk to combine. Remove from heat. Sprinkle the tajin seasoning over the watermelon slice base. Top with the quinoa salad and drizzle the dressing over the top! Note- The salad can be made in advance and refrigerated. Love the vivid colors, Sandhya! An antioxidant cocktail 😊👍! This is a brilliant combination of textures and flavors. 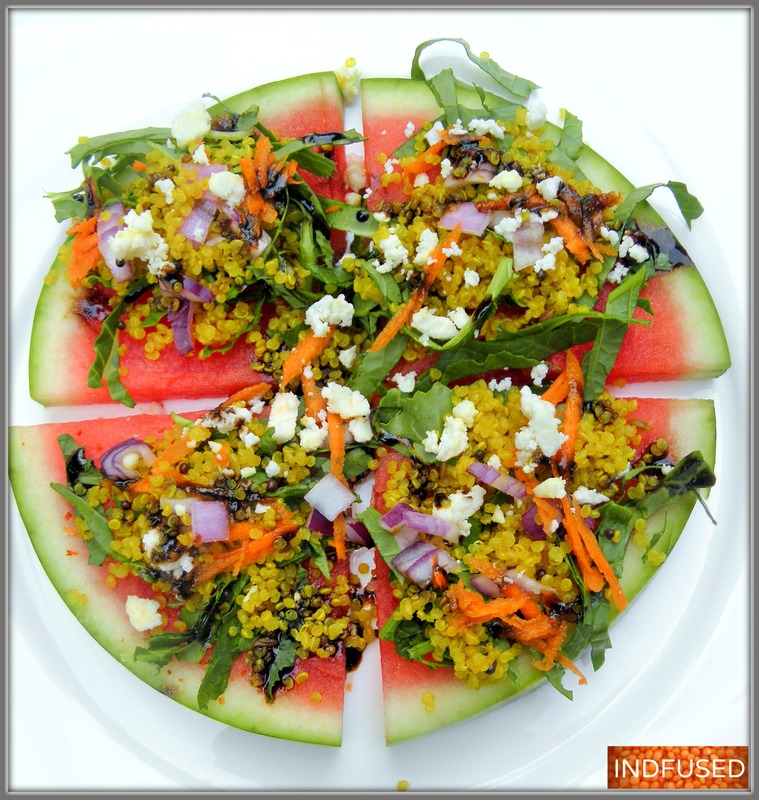 I love the watermelon as the base for that delicious quinoa salad and that dressing sounds fantastic. Thank you Suzanne! I am so excited ! I will enter it in the Food52.com contest. Thank you so much for your sweet words, Judy! We really liked it a lot! Oh my goodness. That is a brilliant combination of colours and flavours, and all so seasonal. I just love your recipes. Thank you Hilda! What a huge compliment this is because I absolutely love your recipes too! Thanks Sonal. Hope your move is going okay. Me too Robin. I love a combination of sweet, sour, salty and spicy! This is definitely art on a plate Sandhya! My word, it looks absolutely gorgeous! What a clever idea too, incorporating sweet, sour and salty on a watermelon slice. Did you ever submit that recipe to Food52 like Suzanne suggested? I’ll bet it would have won first prize. Great job! Thank you Loretta! It was so sweet of Suzzane to let me know about the Food 52 contest. I sure did submit! Thank you so much! I wish I could grow awesome vegetables and fruit like you do!